Daniel Craig's performance as James Bond has been hailed as "terrific" and "simply brilliant" in early reviews of his 007 debut in Casino Royale. The Daily Mirror said he was seen "oozing the kind of edgy menace that recalls Sean Connery at his best". And the Daily Telegraph wrote that he "steps with full assuredness into Sean Connery's old handmade shoes". 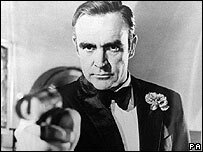 Connery, who appeared in seven Bond films, was recently voted the best 007 of all time. But when Craig was picked to replace Pierce Brosnan last year, a small band of disapproving fans called for a boycott of Casino Royale. In the new film, Bond makes a break from the super-slick, stereotyped spy of the past, the UK newspaper critics said - but all declared the end result a triumph. "It's Bond, but not as we've known it," according to the Telegraph. "The guns and action are there... the girls are certainly there... but the clonking double entendres of the old days are gone - in their place is a much more teasing, smartly written prospect." 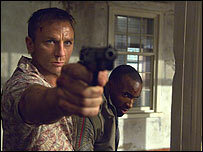 Daniel Craig had a face "like an Easter Island statue" and makes "a terrific debut", it added. "He manages to exude not only danger and unpredictability and wit - but also, and this is a first, some vulnerability." The Times declared: "Craig is up there with the best - he combines Sean Connery's athleticism and cocksure swagger with Timothy Dalton's thrilling undercurrent of stone-cold cruelty." Craig's impressive physique makes him "a far more plausible Bond than many of his predecessors", it added. "But his main asset quickly becomes evident. He can act." The action was "edgy", the paper said, with stunts that were more physical and violence that was more raw. 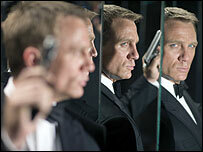 The Mirror said the James Bond rule book had been "well and truly torn up" for the 21st official film. "From the start you can tell this isn't your average Bond film," its critic wrote, adding that it was "easily the best film since GoldenEye". Based on Ian Fleming's first Bond novel, Casino Royale begins with a brutal black-and-white fight scene in a bare bathroom. Since Craig was chosen, the actor and film-makers have promised a more human and gritty character. Casino Royale reaches cinemas on 17 November.